Please accept this as a code violation for "What's Wrong Here?" 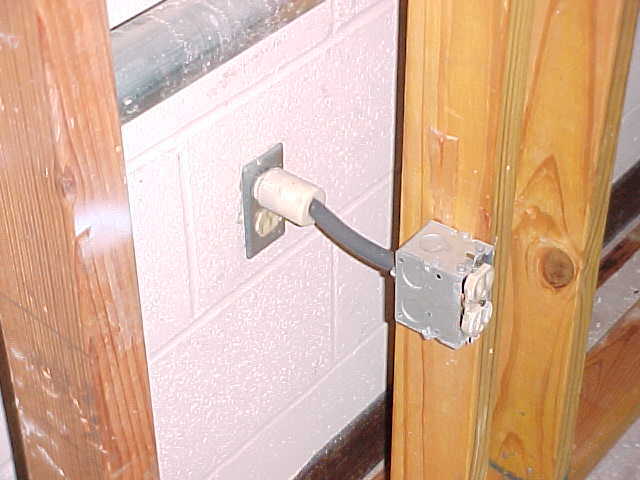 Flexible cords and cables are not permitted as a substitute for fixed wiring and should not be concealed behind walls. This photo shows an outlet that was uncovered within an office building when some sheetrock was removed during a major renovation project of the facility. Please note that the building was purchased by a local University, and the electrical installation may have been done by the original owners. chosen NEC 400-8 (1) and (5). Admitedly, I'm guessing here that one reason for rules regarding flexible cords has to do with deterioration of the insulation over time. I have seen cords where the (rubberized ?) insulation is at the point where it crumbles when touched. What are the worst types of conditions for flexible cords to be under? ... Hot & Dry? I'd have to look at the UL testing protocols to speculate as to why (or when) romex and SO cord are/are not interchangeable. Off the top of my head, I suppose that, in most situations, using SO in place of a "permanent wiring method" is more of a technical violation than a true hazard. I think that the code section was meant to address the semi-permanent use of extension cords, etc., where more protected methods should be used. I'm only guessing. As to rubber "crumbling;" this is usually the result of long-term exposure to ozone in the air. Acid in the air can also cause this. Lest anyone think that I'm endorsing things like the one in the photo- I most certainly am not! I think the "temporary wiring" clause is abused enough as it is. Indeed, the more I work with Romex. MC, etc., the more I like bending pipe! I don't think that the jacket of the SO cord stands up over time. I am in the process of removing a DSC system control panel at a chemical plant. The power supplies were cord and plug connected with SO cord and the jackets are falling apart. The THWN and PVC jacketed control cables in the same panel are in perfect shape. The cords and other wiring is all about 12 years old. I would expect that the jacket of NM is PVC like the shielded cables and would stand up much better over time then the SO cord. It is not just the jacket on the SO cord that is crumbling, the insulation on the conductors is also in poor shape, even where it was protected by the outer jacket. The sad part of a kludge installation like the one shown is that it is so easy to do it right, and probably cheaper than using that expensive HD 5-15P plug. Using an extension box and knockout cover on the wall, a short piece of 12-2 BX between the two boxes would work great, be easy to put together, and meet code. Ed. ED, I was just wondering if you would wrap tape around the joints after conceiling joints on a wall? I hope you twist those wires REALLY good? No one has mentioned 314.29 [ 370-29 ] of the original box being accessible.